Enjoy waking up in a sprawling bed to a magnificent sunrise, view of the ever growing Nairobi’s skyline from the privacy of your plush living room, relish the sunset on a spacious terrace and say goodnight gazing at the city’s sparkling lights. Life at Syokimau is unlike anywhere else. 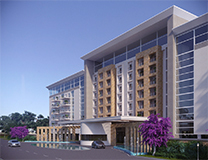 Gateway park is a modern upcoming residential project by Rama Homes limited. The apartments have been designed with the most convinient and necessary social amenities to meet your day to day needs. Gateway park is located along mombasa Road in Syokimau a few meters from the Jomo Kenyatta international airport. The project comprises of 3 bedroom units with a plinth area 130sqm that you can choose from with a total of 8 blocks each 6 floors high, a total of 384 units.